When I received the title to this month’s mandala, I realized that we all talk about needing to be calm, to calm down, to relax, breathe yet we overlook or forget about the next part: STAYING calm. I find I can usually calm down when I need to however before I know it, I’m having to remind myself to calm down again. I can finish a beautiful meditation and within 10 minutes I’m buzzing around doing this and that, all hyped up and raring to go. This month’s mandala reminds us to find a way to stay in “calm” once we achieve it. I know that the more we practice this concept the longer we can stay in this “calm” state. The image of this mandala looks like a human head with an outer band around it, acting like a shield keeping the chaos out and the calmness in. It reminds us that regardless of what’s going on around us, internally we want/need to stay calm. So let’s take time this month to bring our “calmness” to the next level. Be calm…stay calm. Ponder this as you color this month’s mandala. 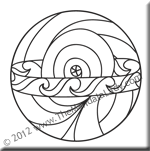 Be sure to download Section 9 of the 2012 Mandala of the Year. The link to the September Mandala doesn’t work. Thought you might like to know. Thanks for all the beautiful designs! The link is now fixed. So sorry for the inconvenience. I’m glad you appreciate the designs. Happy Coloring!